This comprehensive introduction to rock mechanics treats the basics of rock mechanics in a clear and straightforward manner and discusses important design problems in terms of the mechanics of materials. This extended third edition includes an additional chapter on Foundations on Jointed Rock. Developed for a complete class in rock engineering, this volume uniquely combines the design of surface and underground rock excavations and addresses:* rock slope stability in surface excavations, from planar block and wedge slides to rotational and toppling failures * shaft and tunnel stability, ranging from naturally-supported openings to analysis and design of artificial support and reinforcement systems * entries and pillars in stratified ground * three-dimensional caverns, with emphasis on cable bolting and backfill * geometry and forces of chimney caving, combination support and trough subsidence * rock bursts and bumps in underground excavations, with focus on dynamic phenomena and on fast and sometimes catastrophic failures. 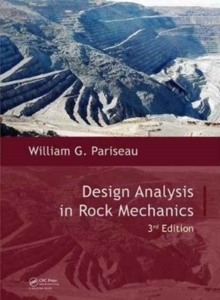 The numerous exercises and examples familiarize the reader with solving basic practical problems in rock mechanics through various design analysis techniques and their applications. Supporting the main text, appendices provide supplementary information about rock, joint, and composite properties, rock mass classification schemes, useful formulas, and an extensive literature list. The large selection of problems at the end of each chapter can be used for home assignment. A solutions manual is available to course instructors. Explanatory and illustrative in character, this volume is suited for courses in rock mechanics, rock engineering and geological engineering design for undergraduate and first year graduate students in mining, civil engineering and applied earth sciences. Moreover, it will form a good introduction to the subject of rock mechanics for earth scientists and engineers from other disciplines.